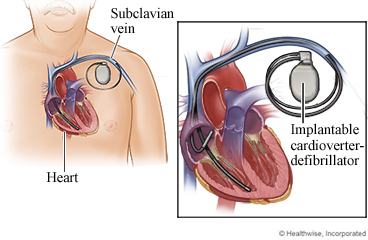 An implantable cardioverter-defibrillator (ICD) is a small, battery-powered device. It fixes life-threatening changes in your heartbeat. If the ICD detects a life-threatening heart rhythm, it tries to get it back to normal using electrical pulses. If the dangerous rhythm does not stop, the ICD sends an electric shock to the heart to restore a normal rhythm. The device then goes back to its watchful mode. The doctor puts an ICD in your chest and attaches it to thin wires, called leads. The leads carry the shocks from the ICD to the heart. Before the procedure, you will get medicine to help you relax. The doctor will make an incision (cut) in the skin just below your collarbone. The cut may be on either side of your chest. The doctor will put the ICD leads through the cut. Most of the time, the leads go into a large blood vessel in the upper chest. Then the doctor will guide the leads through the blood vessel into the heart. The doctor will place the ICD under the skin of your chest. He or she will attach the leads to the ICD. Then the cut will be closed with stitches. The procedure usually takes about an hour. You may stay in the hospital for 1 or 2 days. You can likely return to many of your normal activities after you get an ICD. But to stay safe, you may need to make some changes to your normal routine. You will need to be careful with certain types of electronic equipment. And you'll need to take extra care with medical and dental tests and procedures. You will be given specific instructions after getting your ICD. You may feel anxious or worried about having an ICD. This is common. You might feel better if you use techniques to help you relax. Make a plan for what to do if the ICD shocks you. And think about how the ICD will help you. Talk to your doctor about ways to help ease anxiety. The procedure will take at least 1 hour. Enter W470 in the search box to learn more about "Implantable Cardioverter-Defibrillator Placement: Before Your Procedure".